Conflict continues to brew between Groupe TVA and its unionized employees who, on Sunday, reiterated their vote in favour of pressure tactics up to and including strike action. The some 830 employees of TVA Montréal have been without a collective agreement since December 31, 2016. 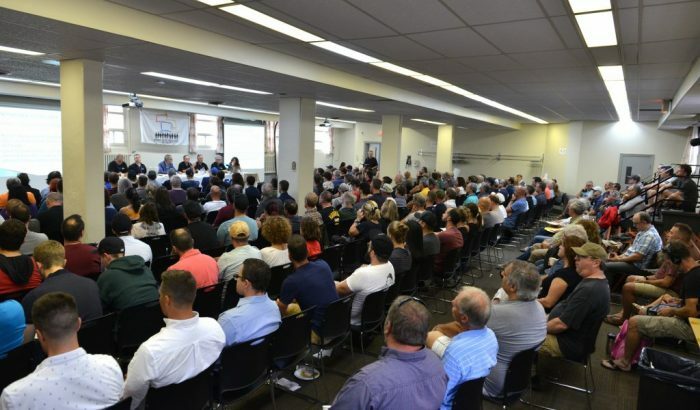 Numerous union members gathered at the Centre Saint-Pierre in Montréal to attend this special negotiation meeting and once again gave their bargaining committee a strong mandate, as they had done last June 19. Several conciliation meetings yielded little progress. Last Thursday, the bargaining committee agreed to extend the conciliation period by a week, thereby pushing back the right to strike or to lock out to September 22. “Our objective remains to negotiate a satisfactory collective agreement for both parties. However, the issues relating to jobs being assigned to TVA affiliates and Quebecor and position vacancies have to be resolved, and to do this, support from our membership is essential,” said Marc-André Hamelin, Montreal president of CUPE 687. For several months, the union has been critical of work normally done by TVA employees being transferred to other Quebecor affiliates such as Quebecor Media or even to MELS studios. “The employer’s claims notwithstanding, some major issues still remain to be resolved during current negotiations. We must display a common front to close the gap standing in the way of a negotiated agreement,” added CUPE union representative Réal Leboeuf. Two days this week have been set aside for conciliation. The union is hoping that Groupe TVA will show its cards and resolve the contentious issues, mainly the contracting out of work that should be done by TVA employees.